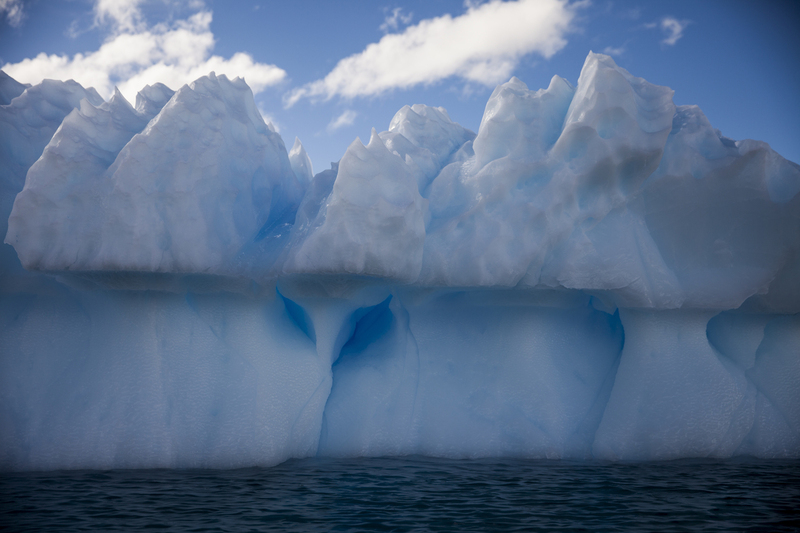 Photographer Captures The Contradictions Of Otherworldly Antarctica : The Picture Show WAMU's Tyrone Turner was mesmerized by the majestic ice and surprised by how he felt in the presence of these massive structures. 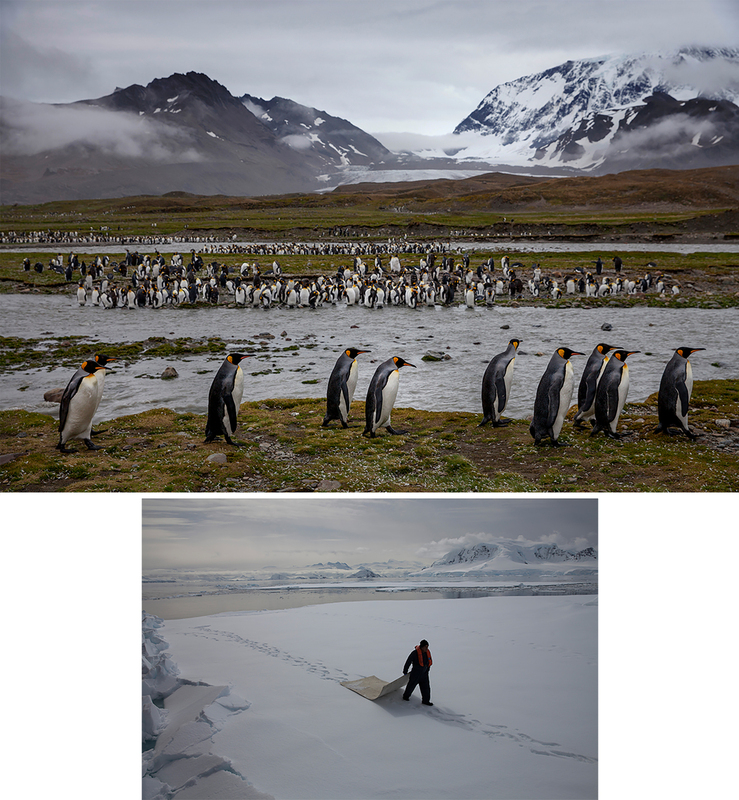 Top: St. Andrews Bay on remote South Georgia island, en route to Antarctica from the Falkland Islands, is home to 250,000 pairs of king penguins, the island's largest colony. Below: A crew member of the National Geographic Explorer ship walks on "fast ice," or thick sea ice that's held fast to the shore at Wilhelmina Bay on the Antarctic Peninsula. 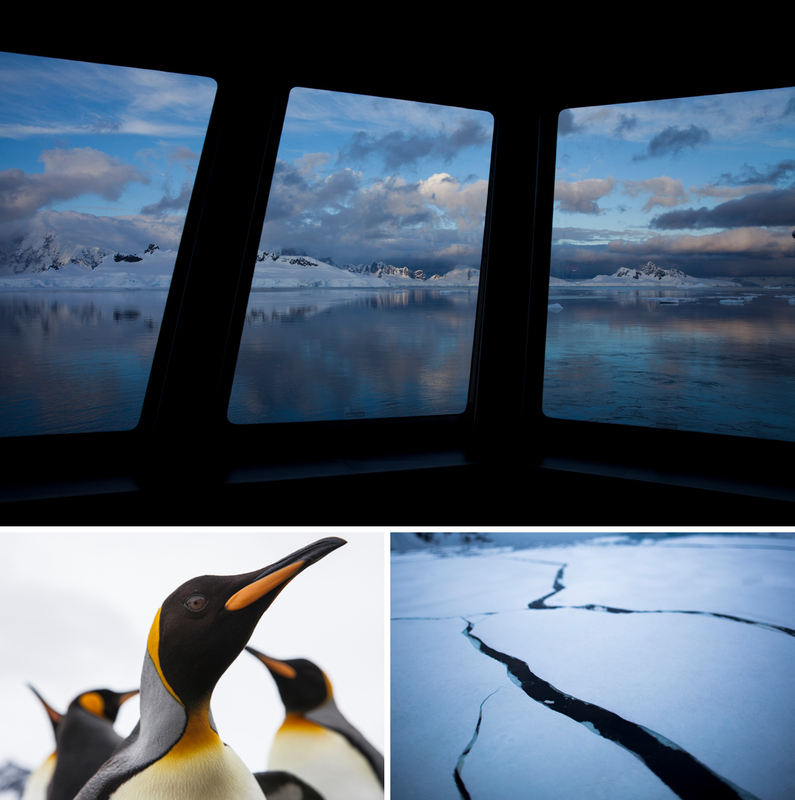 When WAMU photographer Tyrone Turner got the opportunity to travel to Antarctica, he thought he would be fascinated with the continent's wildlife. But instead, it was the ice — in its myriad shapes and textures, "bathed in polar light that morphed from powerfully sharp and blue, to gentle and pink" — that Turner says mesmerized him. "Antarctica just seemed to me absolutely 'the other world,'" Turner says. "There is no other landscape like it." Turner's trip to Antarctica last November began in the Falkland Islands, where he boarded the National Geographic Explorer for a three-week journey. Top: From the National Geographic Explorer ship, a view of Wilhelmina Bay as the sun starts to brighten the sky. Left: Curious king penguins waddle over â some close enough to peck at camera lenses â at St. Andrews Bay on South Georgia island. Right: Long black ribbons of cracks extend from the bow of the ship as it moves through the sea ice. Icebergs mark the approach to the Antarctic Peninsula. Trying to catch the predawn light means being on deck well before the 3:15 a.m. sunrise, when subtler hues bathe the ice forms. In the interview below, he shares more observations about the trip with NPR and how Antarctica defied his expectations. 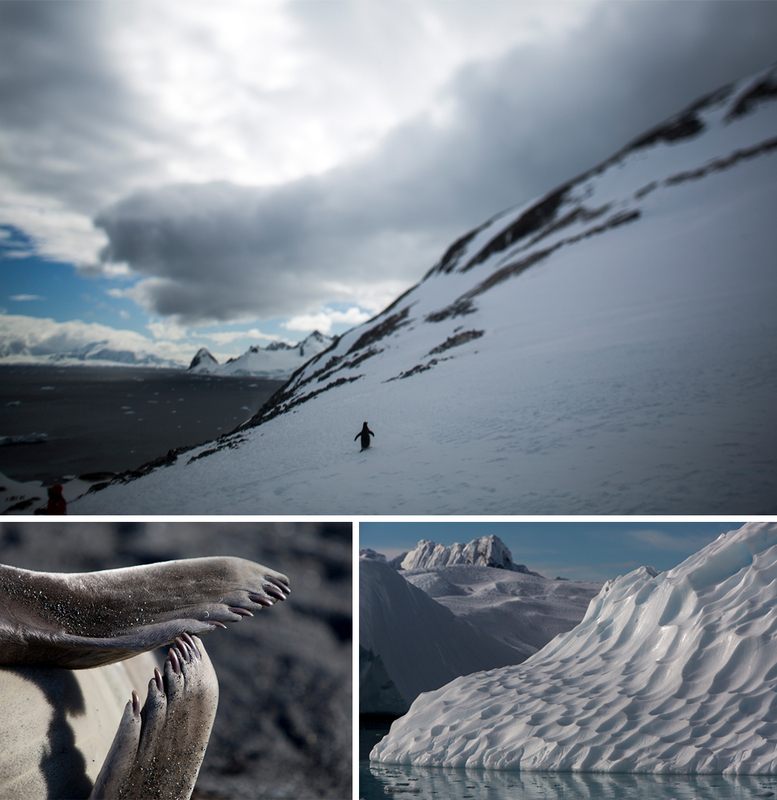 Was there a moment when you knew Antarctica was going to be unlike any other place you'd been before? We're photographing as the light goes down. The light went down at 10:15 a.m. It doesn't get completely dark at this point, and the sunrise is at 3:15 a.m., so I'm out on the deck until about 11 p.m. And I go back, get a couple hours of sleep, and I'm back on the deck at 2 a.m. Because as that light's starting to come up crystal clear, you have the pinks and the oranges and the blues of the predawn light with these icebergs that we're passing, and I fell in love. Top: A lone gentoo penguin on Cuverville Island on the Antarctic Peninsula. This site is host to the peninsula's largest known gentoo penguin colony, about 6,500 pair. Left: A southern elephant seal. Right: This iceberg's golf-ball-like surface is caused by the movement of tidal waters around the ice. 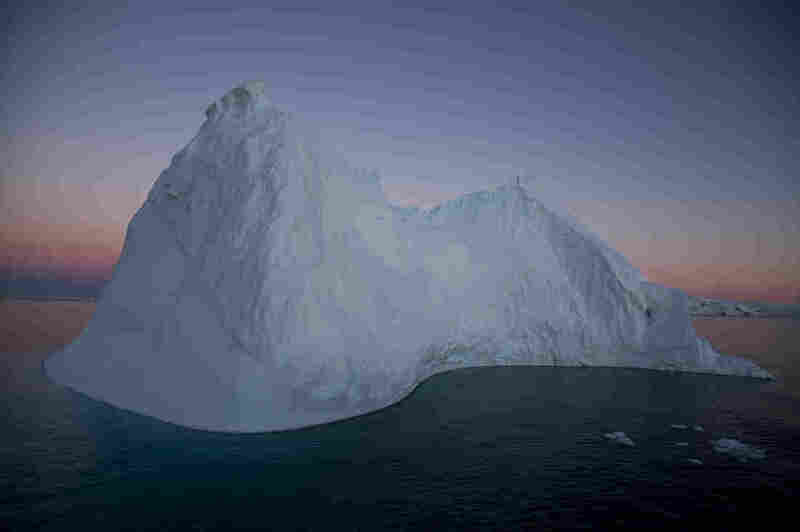 When the icebergs flip, these undersides are exposed. I was totally captivated by that light and by these massive structures. I stopped sleeping at that point, because I just wanted to see that light every time. There is a power in the form and the massiveness of the ice. There's just a power in being near it. It really surprised me how I felt in the presence of these icebergs and the ice down there. You just really were at once excited and a little afraid. The textures and the forms it comes in, was really unexpected. And I did not expect to be as affected as I was by being in Antarctica. I actually thought I would be really into the wildlife — and I was, I really loved that — but I think the ice moved me more. But you did photograph wildlife, such as gentoo and king penguins. What was it like? Penguins don't have very good eyesight, and they're very curious. So, if you just sit down, or lay down, they will come over and investigate. And in one picture, I was lying down — my camera gear's right here — here's this lichen-type covering — you're laying in feathers and penguin poop and stuff like that — and you just lay down and they come over to you. These penguins were really close to me and in fact were pecking at my camera bag. The texture and shapes of icebergs are caused by many different forces, such as the movement of water and air around and through the ice. 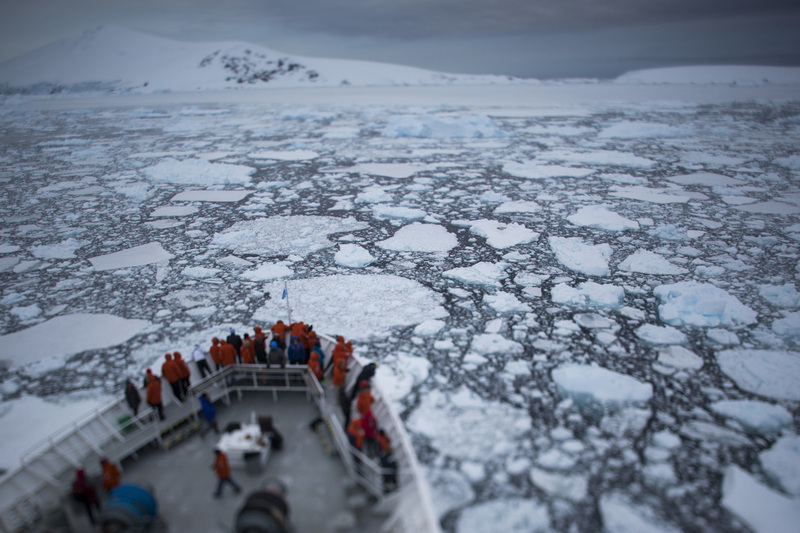 Passengers on the National Geographic Explorer gather to watch as the ship navigates through pieces of sea ice in the Antarctic Peninsula's Lemaire Channel.